Abstract: Diversity is an essential ingredient for collaboration efforts if new insights are to be gained as the basis for the complex issues transformational partnerships seek to address. There is increasing evidence of the value that diverse stakeholders (“beyond the usual suspects”) bring to collaboration. Diversity also brings challenges of – finding respectful and inclusive processes which don’t privilege those with certain education, roles or understanding; seeking out people who wouldn’t ordinarily be engaged; and conflict- different opinions, values and world views. In fact, constructive conflict is important to get beyond the surface of complex issues and build a deep and shared understanding of the context and situation. The article will seek to challenge stereotypes and explore how partnership brokers can effectively involve diversity in partnering and pose the question of whether there is a level of ‘Diversity avoidance’ that we need to overcome for transformational partnerships to be successful. When most people talk about partnering around complex issues and seeking innovation or real change, it is based on an acknowledgement that we have to work together if we are going to make any headway on those things that have been put into ‘the too hard basket’ for too long. Once the decision is made to collaborate or partner, there is often a flurry of activity to seek out people and organisations that we think might have an interest in the topic. The first question asked, is who do we need to get together? If it is truly a complex issue with no simple solution apparent, and innovation is needed, then the shared experience of those involved in partnering and innovation is the more diverse the group, the more potential there is for innovation and breakthrough. When we talk about transformational partnerships, we use the language of multi-sectoral partnering and diversity, but how serious are we really about diversity? Some partnerships describe themselves as diverse because they bring together different organisations, either within or across sectors. However, they are often a group of like minded people who are combining skills and resources to make the best use of available resources, working together to be more efficient and effective. There are many kinds of partnering approaches. The difference between them depends on their purpose. Partnerships can be more transactional, responsive or project focused where the stakeholders know what needs to be done. However, where diversity is absolutely essential, is when there isn’t a clear or obvious answer, and, ‘we don’t know what we don’t know’. This is where partnering is a means to address complex issues and create new ways of doing things that make a difference to ‘intractable problems’, getting beyond ‘business as usual’. This type of partnering can be described as ‘transformational’. In this situation, diversity means stretching beyond the known, and seeking out non-traditional partners. One way to think about diversity is three types of collaboration from Hutch Carpenter: “Peas in a Pod”; “New Partners in Crime”; and “Challengers”. It provides a simple way to describe the difference between pulling together those you already know and generally think alike (Peas in a Pod) and attracting people together to an idea, not based on existing relationships (New Partners in Crime). The third category -Challengers- stretches even further to deliberately seeking out those who make things a bit messy and difficult because they don’t agree. The diversity sought isn’t just about different organisations or sectors, its diversity of expertise, social diversity (such as cultural, gender, sexual orientation, age), informational and experiential diversity. What we are seeking is people who will bring different information, opinions, world views and perspectives to the partnering table. We are not looking for people who will be nice to each other and agree on everything. In fact we are seeking enough difference in the experiences and the way people see things that it will probably cause conflict, discomfort and tension. Why would we deliberately seek out a situation that might be seen to challenge the fundamentals of partnering such as respect, trust, communication? Why is diversity important to transformational partnering? There is much written about the power of diversity as an essential ingredient for innovation. The study of complexity tells us that as human beings we all sort the world looking for patterns that confirm our own experience, training, and knowledge. It is actually very difficult for us to see or hear things differently without some help. Diversity challenges these patterns so that there is the opportunity to explore issues from a fresh perspective.Studies of large innovative organisations, in education, democracy, group processes and business consistently confirm the importance of diversity for innovation, creative problem solving, building depth of understanding and uncovering mutual benefit to ensure sustainability. While there is debate about how much Page’s study on diversity can be generalised, his resulting theorem that “Diversity Trumps Ability” is confirmed across environments. One framework considering economic growth and innovation, identifies diversity as one of four major ingredients to achieving innovation (along with expertise, interaction and application). Diversity is a key ingredient because: “Ideas will only get better when they are openly discussed and considered by a mix of people with a variety of research fields, backgrounds, approaches, and mind- sets”. Sam Kaner, when talking about collaborative decision-making and the importance of understanding group processes points to diversity within groups as a reality that can either be supported for positive outcomes or, if it remains untapped, a source of dysfunction, disillusionment and ‘business as usual’. The positive outcomes of valuing diversity and seeing it as “normal and inevitable” that it will create misunderstanding and miscommunication, is that working through this leads to solid foundations for discovering common ground, shared understanding, innovation and shared responsibility. All of these in turn, essential for sustainable outcomes. So if we agree that: diversity is about stretching beyond the obvious stakeholders; and different world views, experiences and information is an important resource that we need if we are going to get real breakthroughs; then there is a role for the Partnership Broker in supporting and challenging partners to make that stretch. Once made, those of us playing a role in bringing people together around complex issues need to make a decision as to whether we see our role as ‘containing’ and smoothing over differences, or optimising diversity- honestly exploring to better understand the issues faced. We have to challenge ourselves to ask if there is some level of “Diversity Avoidance” going on, that we feel more comfortable with ‘people like us’ who hold the same views and values. Are we willing to be taken out of our comfort zones to have our preconceived ideas and stereotypes challenged? Both the Partnership Broker and the partners have an opportunity to reframe the role of ‘conflict’ as an important face of diversity and apply our skills to constructively explore these conflicts in order to value and support diversity. It is not an uncommon view that conflict should be avoided or ‘managed / controlled’ to ensure a collaborative working environment. I think of all the times I’m asked “how to manage difficult people”. Fear of fighting and conflicting priorities has been identified as one of the eight dangers of collaboration (Nilofer Merchant). In fact, the ‘no’ voice or the conflict can be a critical component of exploring diverse views and gaining new insights and innovation/ transformational change. The next step is how to identify the diversity needed and how to engage them in a topic area that, on the surface of it, they may have no particular interest in. There are many methods of seeking out the diversity, from more opportunistic invitations to someone who happens by, to formal strategies of seeking nominations from diverse groups. Pulling together ‘think tanks’ or forums are common approaches, as well as going to the source by partnering with schools or youth groups for example, to seek out a younger person’s view. One thing that can get in the way of engaging with the diversity needed is the assumption that everyone needs to be involved in the same way to contribute to the partnering efforts. A useful way to think about the partnership group may be that there are different ways that individuals and organisations will be involved and that this can and will also change at different times. The diagram below emerged from discussions within partnerships who observed that not everyone will contribute the same or has the same needs from the partnership. Once that is accepted, it makes it easier for people to engage, contribute and then decide where they sit. This can help take the pressure off people feeling like they need to commit to something that has not yet been clearly worked out, and inform thinking about communication and governance models relating to the different needs and interests of partners. At the end of the day we know that finding the mutual benefit, the common or shared goal is the foundation of the partnership. This is what is returned to when things get tough or disagreement emerges. This also is the basis of bringing diversity to the partnering table. What are we willing to work together on to make a difference? Co-creating this with diverse stakeholders builds shared ownership and a strong basis for the partnering efforts. There are already many tools in the Partnership Broker’s kit that can be used to support and unlock diversity. Acknowledging individual objectives as well as building a shared common objective, identifying what partners can and cannot agree on, respects the differences while still driving for common ground. Role modeling engaging openly with divergent views and giving and receiving feedback, setting the scene for how the group will agree to work together, debate issues and be honest about fears and concerns creates a culture that values diversity and a ‘safe enough’ environment to explore the differences that emerge. Promoting a genuine curiosity- with the use of good strategic questions- I wonder what makes you feel so strongly about this? I’m interested to understand….What would it take to….. open up the discussion. And with the benefit of understanding the principles of interest based negotiation (IBN) and focusing on needs and interests rather than positions partners can be supported to get below the surface of issues being explored. Sam Kaner’s diamond of participatory decision– making is also a useful tool. It helps in the early stages for participants to think widely- not only about the issue for consideration, but also the people who should / could be involved to ensure diversity of perspectives. 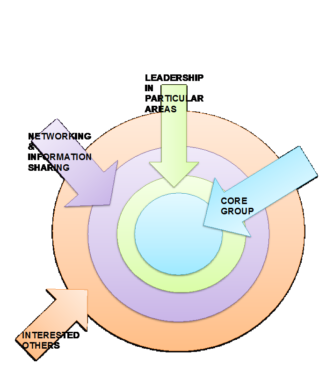 In these early stages the group needs to expand and explore thinking about the complex issue if it is going to benefit from a partnering approach (establishing a shared understanding and ownership as well as benefiting from the knowledge, skills, experience and perspectives). New and diverse perspectives as well as various sources of data and information are gathered. However, its not practical to continue to keep scanning widely and at some point the group needs to start focusing in to identify what small ‘safe to fail’ experiments or projects might be tried in order to identify patterns and learn more about what will work. The point of focusing back in may happen too early and the group realise that they haven’t really pushed the boundaries for diverse perspectives (people) or there is more to understand (information, studies, data, stories). This mid-point which Sam Kaner calls the groan zone (you could also call it the “Have a go” zone). 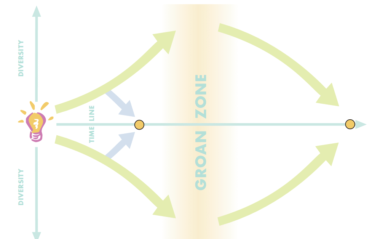 Many will relate the to the ‘groan zone’ term. It can be a time where partnerships falter, deciding that they don’t have enough in common to progress. If the Partnership Broker and the group are aware of this stage however, it provides an alternative to superficial consensus or to disbanding the partnering attempt. Instead it’s where digging below the surface- beyond positions to interests (in IBN terms) and the creative thinking comes to the forefront. At this stage it may mean focusing in and going out several times before there is an agreement its time to converge and move on trying strategies or approach that are truly new and innovative. In addition to getting people to the proverbial table, however, it is critical to use processes that are inclusive of all regardless of cultural, educational or other backgrounds. Again, there are many techniques that have been developed over time to assist people to contribute so that the group can benefit beyond the traditional thinking. The most effective ones I know are based on good strategic question design and a kind of story telling from each diverse perspective. It is important to create an environment where people are encouraged and supported to share their views, knowledge and experiences even if contentious or ‘unfashionable’. Providing time for people to think individually about what’s important for them can be useful, especially for the introverts in a group. Post-it notes, index cards or small sheets of paper can be used for people to note down ideas and issues (one per post-it) and then they can be mixed up for the group to review and group into emerging themes for further discussion and exploration. This can be done individually, or, I like to do a kind of ‘speed story telling’ in pairs or threes where people respond to a prompt question and then everyone takes a turn as teller and listener / writer. ‘Stories’ or experiences can be told from their perspective or someone else’s. This, and the fact that the resulting post-its are mixed up, gives confidence to raise tricky issues. It has the added benefit of being time efficient and energising. This approach comes out of the development of methods for working in complex systems and as such, provides confidence that it will not have the group making ‘business as usual’ type conclusions. The same approach can be used with people selecting or making pictures, taking photographs or constructing a visual picture of the issues using objects such as shells, stones or even bottle tops. The objective is to gain new insights on the complex issue, so its important that people have the opportunity to explore beyond stated positions. The key message here is to review any tool or process that might be used against what is trying to be achieved, where you are in the partnering cycle and in the Kaner diamond of collaborative decision making. As the saying goes, ‘we don’t know what we don’t know’. However, if we create a welcoming, safe, respectful environment to explore diverse views, experiences and understandings, we will dig deep for the ‘conflict’ to gain new insights and be wary of moving too quickly to a perception of consensus. The evidence shows that diversity is an essential ingredient to achieving innovation. It also shows that it’s a reality of group processes that seek to delve beneath the surface of positions to gain shared understanding and ownership. Study of complex systems also tells us that bringing diverse stakeholders together to gain new insights and perspectives on the complex issues being faced is what works. It therefore stands to reason that diversity is an essential ingredient for partnering efforts which seek to address complex issues in new and innovative ways and achieve sustainable outcomes. We have an opportunity to add to the evidence base with a focus on the role of diversity as it relates to partnering and the role of the partnership broker. To do so, we need to pay attention to diversity and its impacts across the partnering cycle. I wonder what is your partnership brokering story of diversity? Marcia Dwonczyk has over 25 years of experience in senior executive roles in the Government and Non-Government sectors, across Australia and overseas. She is currently Director of Creativma- working as an independent innovation and change specialist with a focus on partnering, engagement and complexity. Prior to establishing Creativma, she worked as a full time partnership broker for six years in the health and community services sectors on the Gold Coast in Queensland. An accomplished facilitator, she has conducted national, state and regional community and stakeholder engagement strategies to inform policy reform, planning and initiate partnering. Specialising in working with diverse stakeholders around complex issues, Marcia works with people to build their knowledge and skills in partnering and engagement to develop new approaches to address these issues. Marcia is well known for using a wide range of complex facilitation strategies to ensure that people from a wide range of diverse backgrounds can engage effectively around complex issues. Page, S. (2007) The Difference: How the Power of Diversity Creates Better Groups, Firms, Schools, and Societies. Princeton, NJ: Princeton University Press.